This selfie has been making the rounds on social media. It advertises “halal pork” for sale. For Muslims, halal is permissible or lawful to eat. Pork is explicitly forbidden or unlawful to eat (haram) in Muslim religious law. “Forbidden to you (for food) are: dead meat, blood, the flesh of swine..”(Qur’an, 5:3). That which is forbidden by God’s Guidance in the Quran cannot be be made permissible for Muslims by any human being. 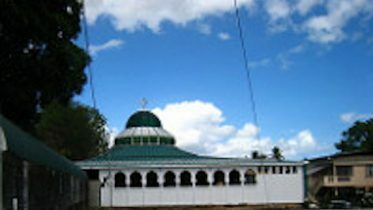 Dr Waffie Mohammed, founder and Principal of Markaz Al Ihsaan of Trinidad & Tobago, said “it is wrong and it’s unfortunate that sometimes non-Muslims do this with the intention to attract Muslim sale.” Dr. Mohammed advised the Muslim Community that their reaction should not be one of anger or emotion. He counseled that the offending party should be educated and informed to ensure that it is not repeated in the future. Dr. Waffie said the supermarket should be educated that “for Muslims that the eating of pork, drinking of alcohol and other unclean blood issues are grave sins”. This story is circulating widely on WhatsApp and was also picked up by Trinidad’s Newsday Online Edition here. 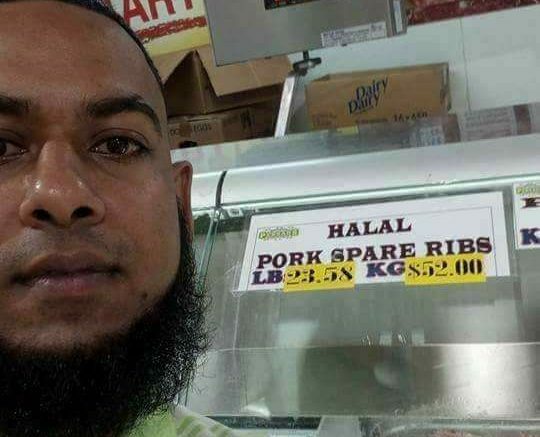 Be the first to comment on "Trinidad Supermarket Advertises Pork For Muslims"